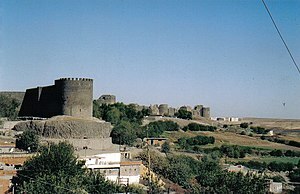 Diyarbakır (Kurdish: Amed‎) is a city in southeast Turkey. It is one of the largest cities in southeast Turkey and is on the banks of the Tigris river. It has 843,460 people (2010). The city was known as the Diyar Bakr ("landholdings of the Bakr tribe") and Mustafa Kemal Atatürk ordered that the city be renamed "Diyarbakır", which means land of copper in Turkish. ↑ See Üngör, Uğur (2011), The Making of Modern Turkey: Nation and State in Eastern Anatolia, 1913-1950. Oxford: Oxford University Press, p. 244. ISBN 0-19-960360-X. This page was last changed on 28 June 2018, at 00:11.